Blacktail Ski Area is one of the newer ski areas in Montana, first opening its lifts during the 1999-2000 ski season. 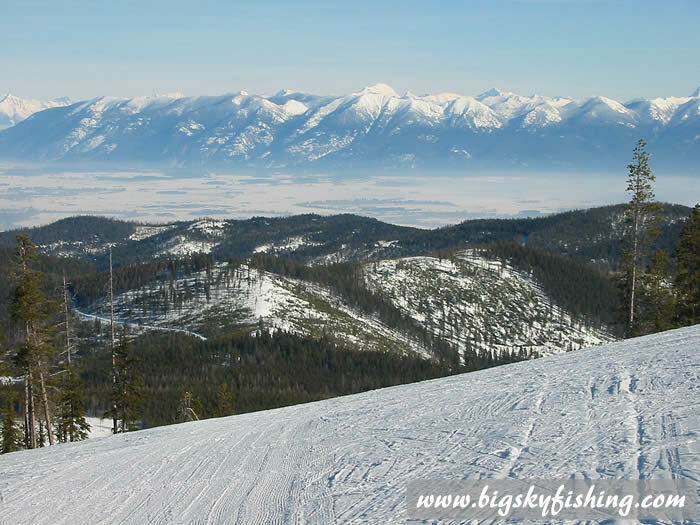 Blacktail is located in Northwest Montana, in the mountains outside the Flathead Valley. The nearest town, Lakeside, is 17 miles away while the largest major town, Kalispell, is 35 miles. Blacktail Ski area, like most other ski areas in Montana, is a “traditional ski area.” What this means is that it caters to local skiers or out-state skiers who seek to be away from crowds, condominiums and other fancy amenities. As Blacktail is a ski area – not a property development company that happens to own a ski area – amenities are low and the cost to ski at Blacktail is very affordable. Blacktail caters to the family skier – and the safe, well groomed trails make for a good place to unleash the kids for a day of downhill skiing. Blacktail is a great ski hill, but it doesn’t cater to everyone. As you can see by the vital stats, 85% of the terrain at Blacktail is rated for beginners and intermediate skiers. The remaining 15%, while rated at the expert level, for the most part falls a bit short of what I would consider “expert level”. Generally, good intermediate skiers can make their way down any ski trail at Blacktail unless skiing conditions are difficult due to heavy snow or ice. But, if you are not an expert skier and like to ski on groomed intermediate trails, you will definitely like Blacktail. 70% of the ski trails at Blacktail are rated for the intermediate skier. The intermediate ski runs at Blacktail are all excellent trails, with a nice mix of twists, turns and a few steeper sections thrown in. These intermediate ski runs are also very well groomed – making it easy for long, carved turns. You get great views from skiing on these runs, too. Beginner skiers will also enjoy Blacktail, as it has a decent variety of beginning terrain that is well groomed and not packed full of skiers. Additionally, Blacktail Mountain has a highly regarded ski school. It is, in particular, a very “kid friendly” ski school – being both affordable and having a staff that is well trained in dealing with young, new skiers. So what about if you are an expert skier? Should you not even bother with Blacktail?? Of course not! While Blacktail does not have the most challenging of terrain in Montana, it does have some nice gladed runs that provides good tree skiing during favorable snows. Moreover, even if you are an advanced skier, it is always fun to hit a new ski area – and Blacktail does have an enjoyable network of ski runs that are excellent places to polish up on your technique or carved turns. Blacktail is a bit different than other ski areas in the country. The base lodge for Blacktail Mountain is located on the TOP of the mountain, not at the base. This, of course, makes for an excellent view from the lodge – with numerous mountains and Flathead Lake all readily visible on a clear day. Having the lodge – and the parking – on top of the mountain, though, also makes for a rather long ride to reach the ski area. The road to Blacktail Mountain, while it isn’t bad, isn’t great, either. The road to Blacktail begins in Lakeside. For the first several miles, the road is paved. But then the road turns to gravel and begins a 3000 vertical feet climb, 14 mile drive, up to the summit of Blacktail Mountain. During the winter months, the road is well plowed, but it is not salted or anything. Additionally, the road makes lots of fairly sharp curves on its way up to the top of the peak. In sum, the road is pretty safe provided you drive slowly. Also don’t plan on leaving Lakeside and expecting to reach the summit in 20 minutes! Blacktail Ski Area also has a great lodge. 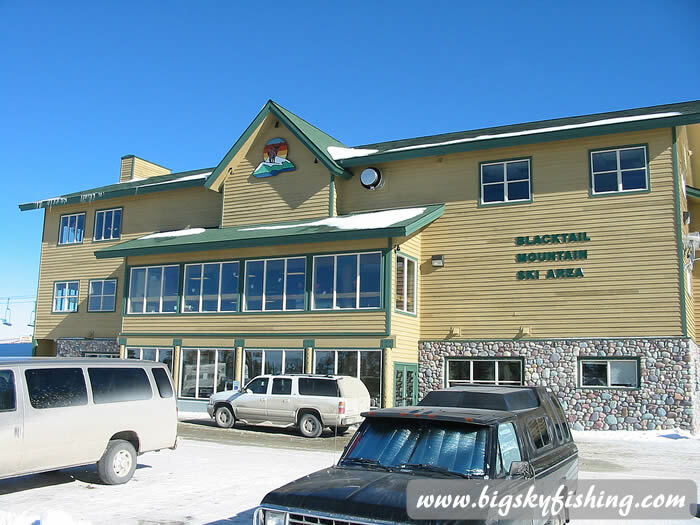 The lodge at Blacktail has a ski school and ski rental on the first floor, a nice cafeteria and changing area on the 2nd floor and a bar/grill on the third floor. Unlike some of the lodges at the mega-resorts, the lodge at Blacktail is inviting and enjoyable to spend some time relaxing in. Parking is generally a snap at Blacktail Mountain. Except on weekends, you can usually find parking within about 50 feet of the lodge. On the weekends, Blacktail Mountain does fill up a bit more with people (many Flathead Valley residents make their way up to the mountain on the weekends), but the ski area is still far from crowded. In other words, you won’t have to worry about parking when heading up to the ski hill. Overall, Blacktail Ski Area is a great place for family skiing. The affordable lift tickets, combined with weekly specials, make Blacktail a great place to go for families in search of downhill skiing on a budget. Beginner and intermediate skiers will enjoy the wide variety of well groomed trails. The lack of crowds at Blacktail also eliminates lift lines, crowded slopes and takes the hassle out of parking. In short, Blacktail Ski Area is a fun place to go. Terrain : 15% Beginner, 70% intermediate, 15% expert.